Scania has further broadened its comprehensive range of Euro 6 truck engine range with the introduction of a 450 horsepower, SCR-only 13-litre unit in order to provide operators a choice of EGG/SCR or SCR-only at this key power point for 44-tonnes gross train weight operation. 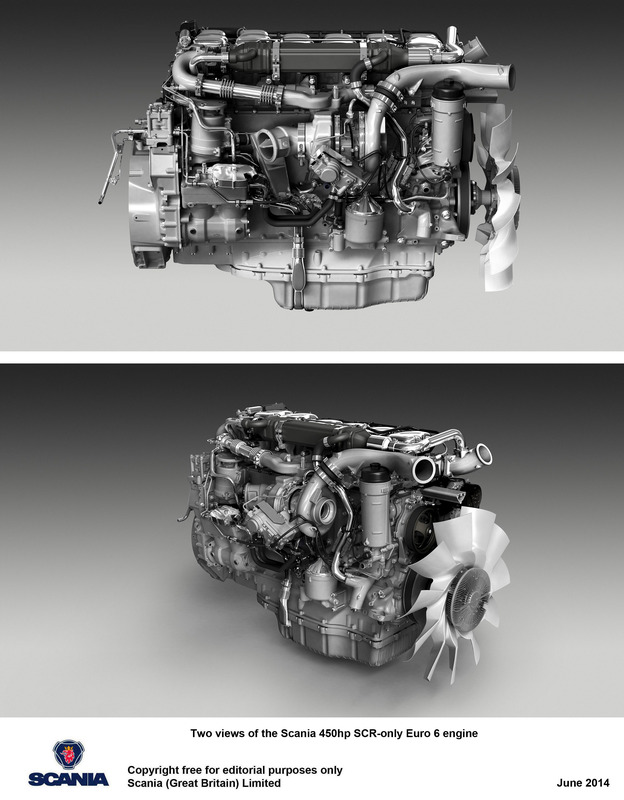 “This engine effectively marks the launch of our third generation of ever-more fuel efficient Euro 6 engines,” comments Martin Hay, UK Truck Sales Director for Scania (Great Britain) Limited. “The 410 horsepower version of our SCR-only 13-litre engine has proved itself to be immensely frugal in service, while also offering a less complex Euro 6 engineering solution. This has encouraged us to further explore and develop the options, the outcome being our new 450 horsepower SCR-only unit. 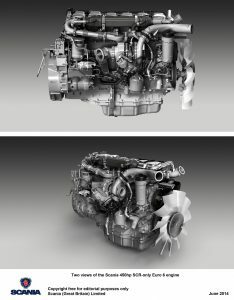 The new Scania 450 horsepower engine, designated DC13 147, requires neither a variable geometry turbocharger nor an EGR cooler. According to Scania’s calculations, a Scania Streamline equipped with the new engine results in a one percent fuel saving compared with the EGR/SCR model – everything else being equal. Countering this, engines using only SCR technology require more AdBlue. In the case of Scania, this is normally an average of six percent of diesel fuel, while engines with EGR and SCR normally require three percent. For those who want to optimise their diesel fuel capacity, Scania offers a wide assortment of AdBlue tanks, including special solutions that use vacant space inside the frame in an intelligent way. In common with the EGR/SCR model, the new engine has an impressive torque: maxi¬mum torque is 2,350 Nm and is available from 1,000 r/min, thereby assuring excellent driveability.